In the previous section (project guide), we saw the creation of project and adding pipelines to it. In this section, we will investigate the run settings to initiate our new run. Similar to pipeline section, Save, Download Pipeline, Copy Run and Delete Run icons are found in the header section to manage your run. Besides, optional Run Description section is exist just below the header section. 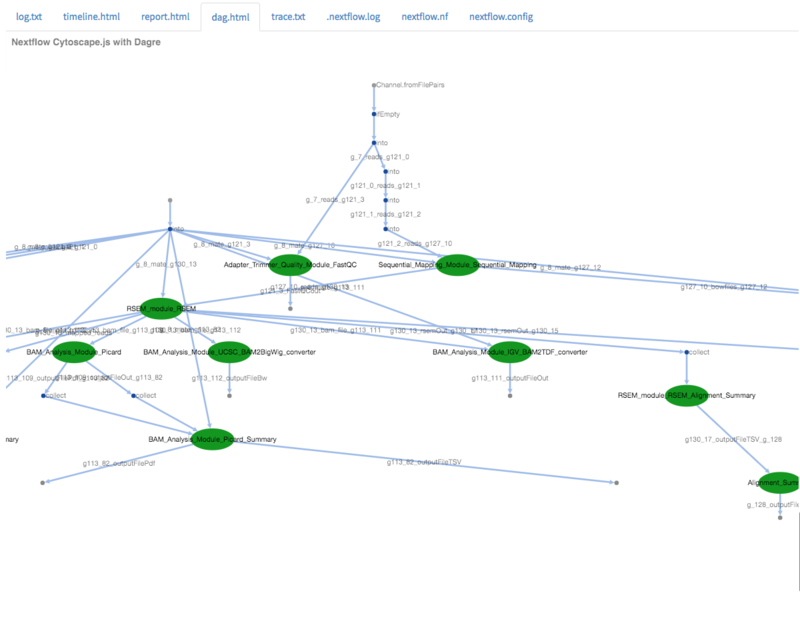 Work Directory: Full path of the directory, where nextflow runs will be executed. Run Environment: Profile that is created in the profile page. If Amazon profile is selected, then status of the profile should to be at the stage of running. Inputs: Value and path of the files need to be entered. If amazon s3 path is entered as a input or publish directory path, amazon keys (which will appear in the Run Setting section) need to be also selected. Running Nextflow is executed and running the jobs. Completed Nextflow job is completed. Run Error Error occured before submiting the jobs or while executing the jobs. Terminated User terminated the run by using “terminate run” button. RunOptions (optional): You can enter any command line options supported by the docker run command. Please click this link for details. Use Singularity Image: Alternative to Docker, you can activate singularity image by clicking “Use Singularity Image” checkbox and entering relevant fields. The only requirement is the installation of the Singularity on the execution platform. Mounting directories in singularity requires you to create the directories in the image beforehand. Publish Directory: Work directory is default publish directory for DolphinNext. If you want to enter new publish directory, just click this item and enter the full path of publish directory. Both local paths (eg. /home/user/test) or amazon s3 paths (eg. s3://yourbucket/test) are accepted. Executor Settings for All Processes: If any option other than local and ignite is selected as nextflow executor in the profile, it is allowed to override and adjust these settings by clicking this item. Following settings will be prompted: Queue, Memory(GB), CPU and Time(min.). Executor Settings for Each Process: You may change executor settings for each process and override to executor settings for all processes by clicking this item and clicking the checkbox of process that you want to change. This will only affect the settings of clicked process and keep the original settings for the rest. Similarly, following settings will be prompted for checked process: Queue, Memory(GB), CPU and Time(min.). Delete intermadiate files after run: This is default settings for DolphinNext to keep only selected output files in the work/publish directory and removing the rest of the files. Here the main goal is to minimize the required space for each project. Permissions and Groups: By default, all new runs are only seen by the owner. However, you can share your run with your group by changing permissions to “Only my groups” and choose the group you want to share from group selection dropdown. This section is separated into two groups: inputs and outputs. Outputs: When the run successfully completes, the path of the output files will be appeared in this region. To give you an overview, overall pipeline and its description are showed in this region. You may hide it by clicking minus/plus icon just next to Workflow title. Log section keeps track of each run logs which is initiated by clicking Ready to Run button. You can monitor each step of the run both before and after nextflow execution as shown at figure below. Reports tab will be appear in the run page as soon as run is initiated by clicking Ready to Run button. You can view output files in various modules such as R-Markdown, Datatables, Highcharts, HTML or PDF viewer. 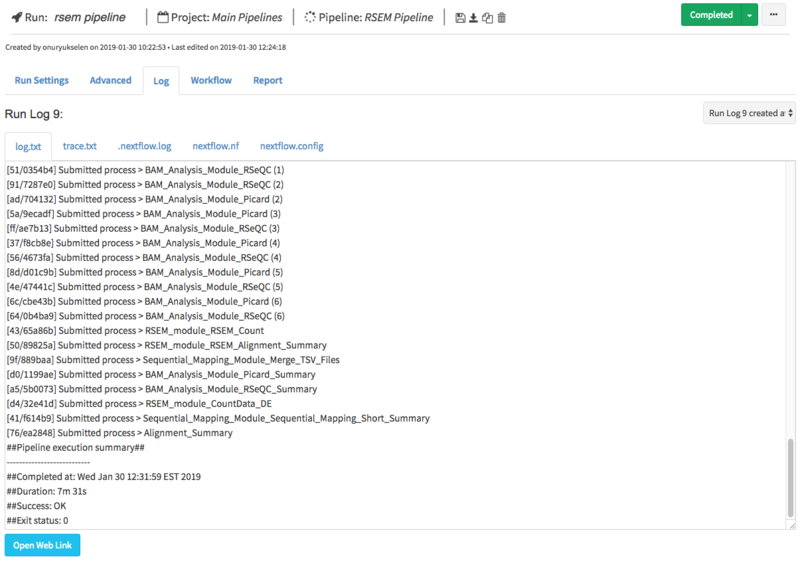 Please check the example report section of RSEM pipeline at below. Each report row corresponds to output parameter in the pipeline workflow and you can easily visualize their content by clicking on each row. All these sections have download, full screen, and open in new window icons in order to help you to investigate each report. You can reach the details about R Markdown in their web page by clicking this link. At the top of R-Markdown module, there are several icons which will help you to edit your rmd file, save as a new file and download in various formats such as RMD, PDF or HTML. In order to facilitate the review process, you can click “full screen” icon to fit the module in your screen. Besides you can adjust Auto Updating Output and Autosave features by clicking settings icon. Auto Updating Output: If enabled, the preview panel updates automatically as you code. If disabled, use the “Run Script” button to update. Autosave: If active, DolphinNext will autosave the file content every 30 seconds. This module powered by Datatables which allows you view, sort and search in the table content. Please check following two examples where alignment and RSEM summaries are shown. This module allows you to fit the table in your screen by clicking “full screen” icon on top of the module.